There’s no doubting why this property was named “Serenity Hill”. After 15 years of enjoying all this property has to offer, our vendors have made the decision to move north to be closer to family. During their tenure, our vendors have put in the hard-yards to set up the property and any keen horse enthusiast or small-scale farmer will appreciate all that’s on offer here. Set atop the flood-free ridge, the bessa block home is surrounded by a myriad of farm infrastructure, including: A shed/studio adjacent to the house, which has power connected, an old kitchenette, air conditioner, bathroom, and two carport bays. Large farm shed with power connected, 3 open bays, and two lock-up bays with cement floor and roller door. Single bay earth floor shed. Two stables with automatic watering systems and adjacent tack area. 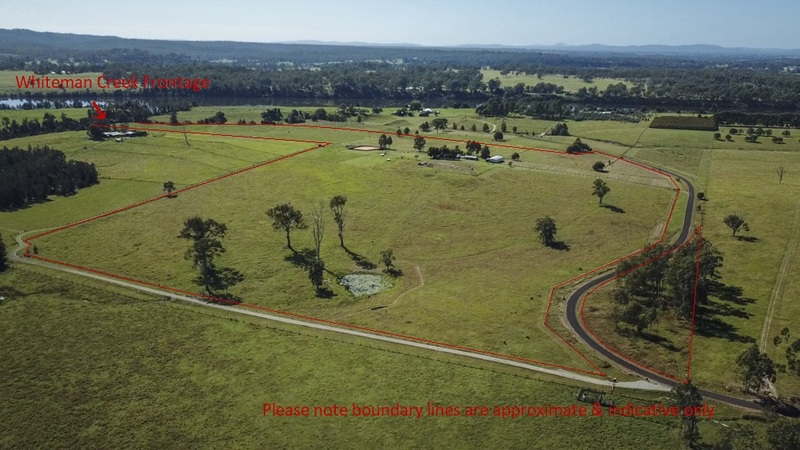 Good sand arena with adjacent steel cattle yards with crush, headbale and timber loading ramp. Garden shed, chicken coop, dog kennels and a sheep pen are also established. The property itself totals 65.2 acres, divided into 10 paddocks, and boasts frontage to the tidal Whiteman Creek, just 200m from its confluence with the mighty Clarence River. The creek doesn’t go brackish, and riparian rights allow you to pump water for stock & domestic use – plus there’s the added benefit of being an ideal swimming, fishing and boating spot! The lower parts of the property benefit from periodic flooding, resulting in fertile soils and productive land. A permanent dam and gravity-fed reticulation system provides water to the livestock paddocks. The home features an enclosed entertaining area, with an open-plan kitchen, living and dining area. Air conditioning and a wood heater will ensure year-round comfort, along with two sitting areas to soak up the morning sun, or utilise as an office or kid’s play room. Each of the three bedrooms have built-in robes, and the master bedroom has a newly renovated ensuite. To top it all off, the home is privately located, with no close neighbours, toward the end of a rural cul-de-sac, and is only 18km to the CBD of Grafton. 151 McGraths Lane is presented to the market to be sold on or before the auction day, scheduled for 26th May 2018. Please come along to one of our open homes, or arrange a private inspection; don’t be left wishing you’d made your move sooner!